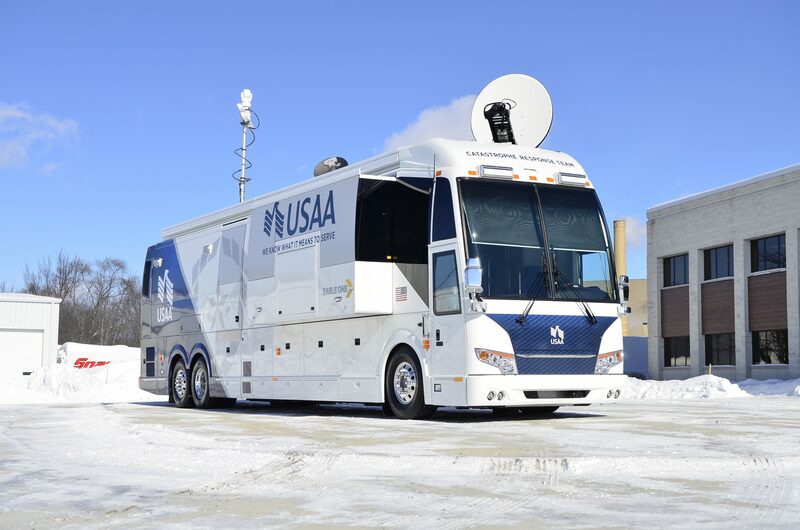 USAA chose LDV to build their new mobile command center/catastrophe response vehicle. The truck is built on a Prevost chassis with a Volvo D13 diesel engine (pusher) and an Allison B500 6-speed automatic transmission. The vehicle features three LDV-built flat-floor slide-out rooms to maximize interior space and a wheelchair lift for accessibility. LDV added a passenger seat to the front of the vehicle (Prevost supplies one) and recovered both front seats with customer-selected material. A Zone Defense backup camera system was installed as well as a 1080P video-recording dash cam. A galley kitchen complete with microwave, Keurig™ coffee maker and refrigerator was installed. Custom fabricated aluminum cabinets are utilized throughout the vehicle for storage. Solid surface countertops were selected for durability. Electric power comes from two 25kW diesel generators. Vehicle automation comes from dual LDV Intel-I-Touch™ touch screens.